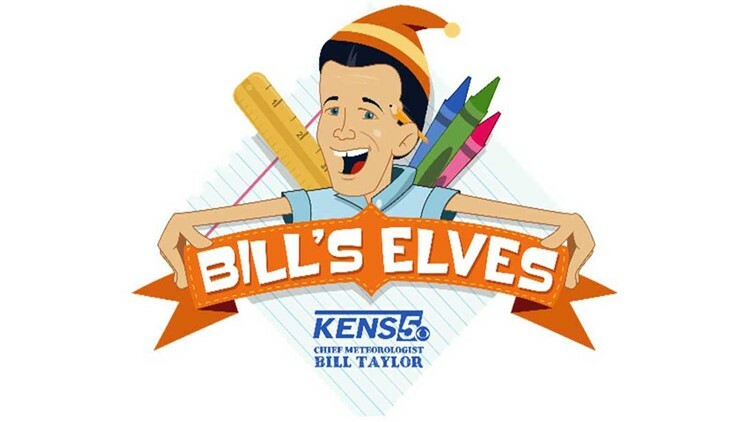 BILL'S ELVES: Drop off school supplies and meet KENS 5's Bill Taylor! Calling all of Bill's Elves! We need your help to make sure thousands of San Antonio-area kids under the care of Child Protective Services get a good start to the new school year! Calling all of Bill's Elves! Child Protective Services needs our help! There are nearly 8,000 children in the San Antonio area who have been abused or neglected and are now under the care of Child Protective Services, and we'd like to make sure each of them gets a good start to the new school year! Please join KENS 5 Chief Meteorologist Bill Taylor, AFFCU and Atlas Floors Carpet One as we collect school supplies! Drop off your new school supplies at AFFCU locations from July 23 to August 6, 2018. You also can bring supplies to the KENS 5 Studio, 5400 Fredericksburg Road, now through August 6. Donate to the Bill's Elves fund online: Link coming soon! Friday, July 27 | 4 - 7 p.m.
Friday, August 3 | 4 - 7 p.m.
Monday, August 6 | 4 - 7 p.m.
Wednesday, August 1 | 4 - 6:30 p.m.
Make a monetary donation... Watch KENS 5 Eyewitness News at 4, 5 and 6 for number to dial! Thanks for helping out! It's important for San Antonians to work together to make sure that these children have the best opportunity to succeed in the new school year!